Social-enabled customer service requires three primary capabilities. 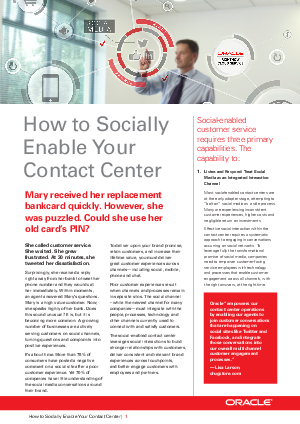 Listen and Respond: Treat Social Media as an Integrated Interaction Channel Most social-enabled contact centers are at the early adopter stage, attempting to “bolt on” social media as a side process. Many are experiencing inconsistent customer experiences, higher costs and negligible return on investments. Download this White Paper for more info.